From 9-5 I work as a sales consultant at Proven Business Systems, working with clients to improve their IT infrastructure and equipment. I have to work out in the mornings or it won’t happen. I drive an hour every morning to start my day at CTF and then head to the loop for work. The workouts set my energy level for the day and my days seem a bit off when I miss a class. 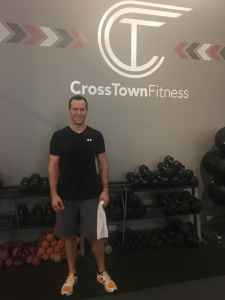 Close to four years ago, a close friend and fellow CTF member Tory Cosich, told me his friend was opening a gym and I had to check it out. At the time I lived in the West Loop and my daughters were 1 and 2 years old. I was going to the gym, but it was always a rush and a mediocre workout at best. Time at the gym was hard to fit in the schedule. A month before CTF opened I trained with Tory and a few other “original members” in the dust and unfinished box that became CTF. I lasted about 20 minutes and told myself I wouldn’t go back. Later that day I felt the urge to try it again. I went back anytime I could until it officially opened and joined right away. CTF has become an important part of my life and I love going every day I can. Fun fact : I live in Mokena with my wife and two daughters. My 4 and 6 year old girls are already doing burpees and box jumps with me at home. My wife Cressie and I lead CTF style workouts in our garage for our neighbors on the weekend. We are waiting for CTF Mokena to open! ?